The city of Barcelona was the place to be this past weekend. The first international competition of the season was held near the “Font Màgica de Montjuic” just below the MNAC, an imposing palace created for the International Exhibition of 1929. So there was no better place in Barcelona, people gathered there to see some of the best riders in the world competing for the trophy. This year was the first time this competition has been classified as class H1, which means that the riders could get some points for the UCI Trials World Ranking. This is why there were more than 40 riders from 8 different nationalities in the Elite category, and the spectators could enjoy the presence of multiple world champions like Abel Musiteles, Vincent Hermance and Benito Ros amongst others. The national TV was there all day and they offered the mens and womens finals live streaming. So it was an excellent event for the sport with more than 1.800 spectators on site and 40.000 online. The sun was shining and the spectators could enjoy the high level of all the riders competing. 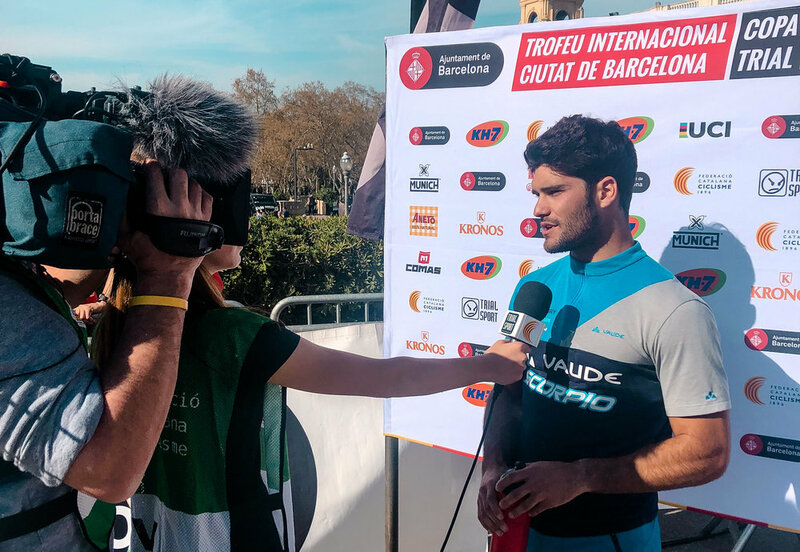 Pol Tarrés started in the first group at 13:00, he said he really liked the sections and that the organiser ( Trialsport Team ) did a really good job because the sections were difficult but doable so the riders had to focus a lot to get as much points as they could. It was a extremely tight semifinals, Tarrés did 580 out of 600 points, which is a remarkably great ride. For the surprise of everyone, the first four classifieds, Pol Tarrés, Borja Conejos, Alejandro Montalvo and Ion Areitio did the exact same points. The 5th and 6th with the ticket to the final were the Slovakian Samuel Hlavaty and the French Nicolas Vallée. At 17:00 the finals started with the best 6 riders of the morning: Montalvo, Conejos, Areitio, Tarrés, Hlavaty and Vallée. They offered an spectacular show for the spectators because until the last section the winner was not decided. The battle for the first was against Montalvo, Vallée and Areitio. Finally Vallée could get 260 points against the 250 of the Spaniards. Tarrés gave everything he had but it was impossible for him to battle for the first places, it is still early in the season but he was happy with his performance and for the show they gave as he comments below. He finally ended up in 5th position and he will get some points for UCI Trials World Ranking. You can see all the results by clicking here.